Place the herbs in a blender. Turn the blender on high- add the olive oil, and salt and pepper. Blend on high for 1 minute. Place the water in a small soup pot- add the salt and pepper. Bring the water to a boil. Add the grits and cook until done- approximately 5 minutes. Cover, and set aside. Place a medium sized sauté pan on the stove over high heat. Add 2 tablespoons of herb oil. Sauté the spinach, peppers and tomatoes for 1-2 minutes, season with salt and pepper. Place the grits in a bowl- put the sautéed vegetables on top of the grits. In a non-stick pan, cook one egg sunny-side up. Season with salt and pepper. 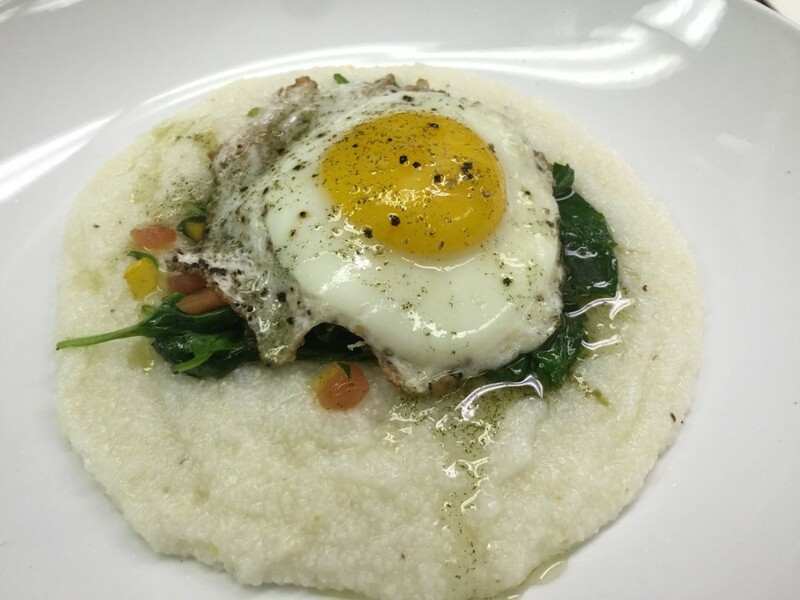 Place the cooked egg on top of the plated grits and sautéed veggies.